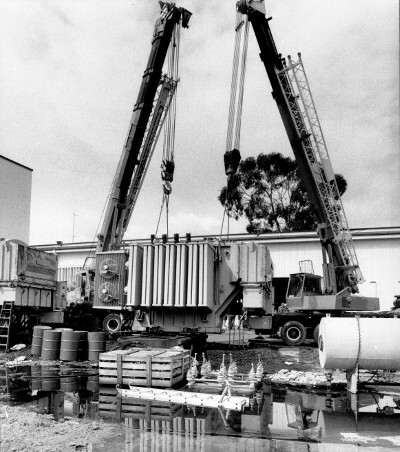 A transformer being lifted by crane at the Kingston Electrical Workshop 08/12/1987. Click on image for larger view. "It is understood the electric light will be switched on to the various buildings and offices at Canberra and Duntroon during the present week. The spur wheel, two of which broke during the testing at the Power House have been now made of steel, in lieu of cast iron as before." On the 22nd July 1915, the Queanbeyan Leader described the Powerhouse as "almost completed" then reported on the 9th August that "Both Canberra and Duntroon are now supplied with electric light from the Power House." The significance of the Kingston Powerhouse in the planning of Canberra should not be underestimated. 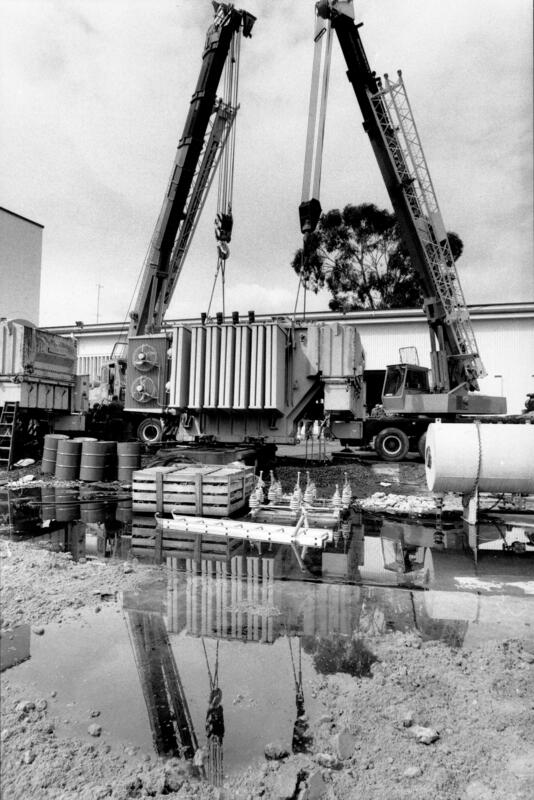 For the first time in Australia, town planners had the opportunity to incorporate an electrical distribution infrastructure in the foundation of a major city. However, the Powerhouse was not the only large building in the precinct. As Canberra's population grew, so did the demand on electricity supplied by the Powerhouse. The Department of Works constructed a substation adjacent to the Powerhouse as well as several ancillary buildings during the 1920s and 1930s. It was also during this time that the area of Kingston, between Wentworth Ave and the Molonglo River, became the de-facto industrial estate for Canberra. From 1936, the Kingston Powerhouse became part of the NSW electrical grid. But over time, as other NSW power stations joined the grid, the Department of Works gradually wound down electricity production at Kingston. In 1957, electricity production at the Kingston Powerhouse ceased altogether with the focus of the precinct shifting to that of a power distribution hub for central Canberra. It was in this role that the Department of Works constructed a large "Electrical Workshop" in the precinct in 1958. In its prominent position on Wentworth Avenue, the workshop effectively hid the Powerhouse for almost 50 years. The file PC22/1/1A - Department of the Interior - New Electrical Workshop - Kingston Power House documenting the planning of workshop is ArchiveACT's Find of the Month. "Damp conditions would affect electrical equipment"
In December 1943, the National Capital Planning & Development Committee (NCPDC) discussed the siting requirements for a proposed electrical workshop near the Kingston Powerhouse. At the time, the NCPDC, while admitting that the Powerhouse "appeared to be a permanent requirement", were unsure as to the "future treatment of the area and the question of whether or not it should be designated for industrial purposes." "Mr Fraser stated that an important factor in the situation was the question of moving heavy transformers and other equipment from the sub-station into the Electrical Workshop for servicing. It was not desired that the distance be very great in view of the expense and difficulty in handling such equipment, some units of which weighed ten tons." At this time, the NCPDC considered locating the new workshop north of the Powerhouse between the Powerhouse railway spur and Molonglo River. They noted, "this area was occupied by large stacks of coal" that "proved to be emergency stocks due to war conditions." They also entertained the idea of siting the workshop west of the Powerhouse, which would require the removal of two workers' cottages. 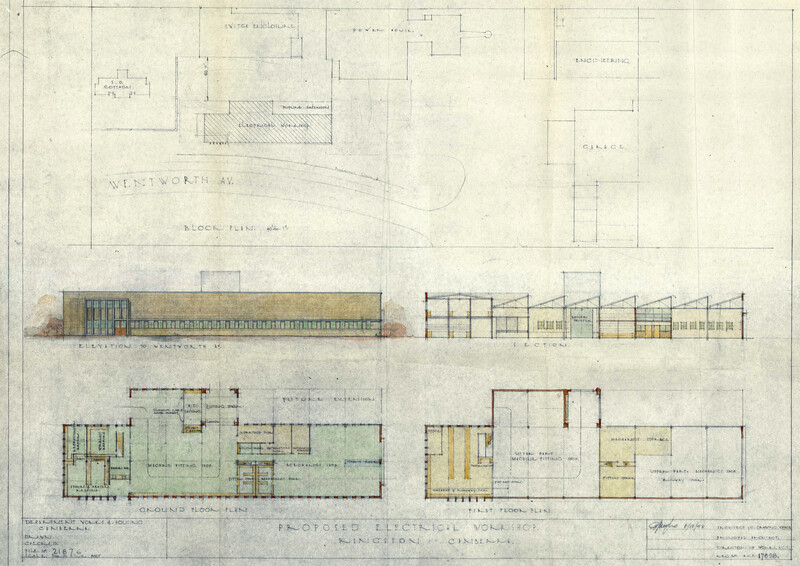 The Department of Works prepared plans for an 'L' shaped workshop which the NCPDC approved in March 1944. However, in May 1946, the Department requested the NCPDC reconsider the scheme as "the site was too near the river and the damp conditions would affect electrical equipment." 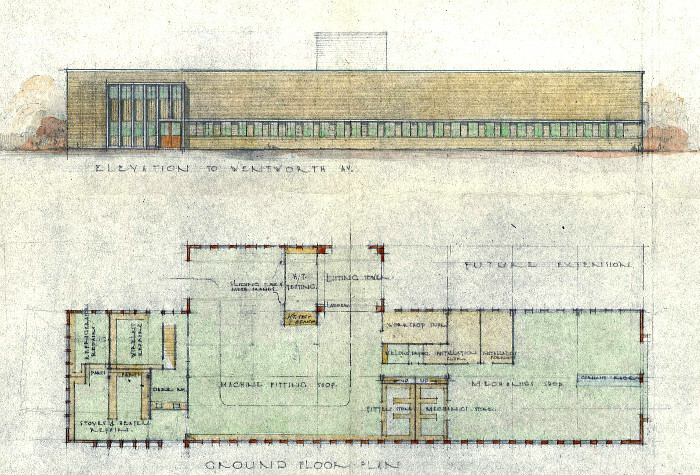 This resulted in the Department proposing an alternative for the electrical workshop "between the sub-station and the Avenue, and the Power House and the wooden residences." Kingston Powerhouse precinct in 1950. The Department produced several building designs with the NCPDC approving Plan No. A.C.T. 15906 (See National Archives of Australia: A2617, SECTION 13/15906). Nevertheless, when the NCPDC carried out a site inspection the following month, the Executive Member C.S. Daley questioned the workshop's close proximity to Wentworth Avenue. He stated that it was highly desirable any permanent buildings on main avenues should be set back some distance from the building line. This principle did not seem to be considered in the present proposal. On a second site inspection in February 1947, the NCPDC found "flags showing the proposed location for the building indicated, roughly, the same position as that which it had previously considered to be unsuitable." The NCPDC requested new plans prepared "showing the exact relationship to the site of the Avenue boundary." "The Building is Urgently Required"
In October 1948, the Department of Works submitted the revised Plan No. A.C.T. 17898 to the NCPDC. In an attached memorandum by the Director of Works, W.E. Potts, it was asserted the workshop was urgently required by the Department for electrical repairs and maintenance. He also noted that the siting between Wentworth Avenue and the existing switch enclosure would provide an effective screen for that structure. Finally, he proposed that the electrical workshop should be "of brick construction with cement rendered trim and with metal window frames and sashes." Plan No. A.C.T. 17898 of proposed electrical workshop at Kingston. Click on plan for larger view. "The design shown on Drawing A.C.T. 17898 is generally approved subject to replanning the western bay of the building by setting it back from the building line as far as possible, to consideration being given to revising the level of the windows to the front elevation, and to slight amendment of the fenestration at the ends of the main wall to obtain more effective contrast." 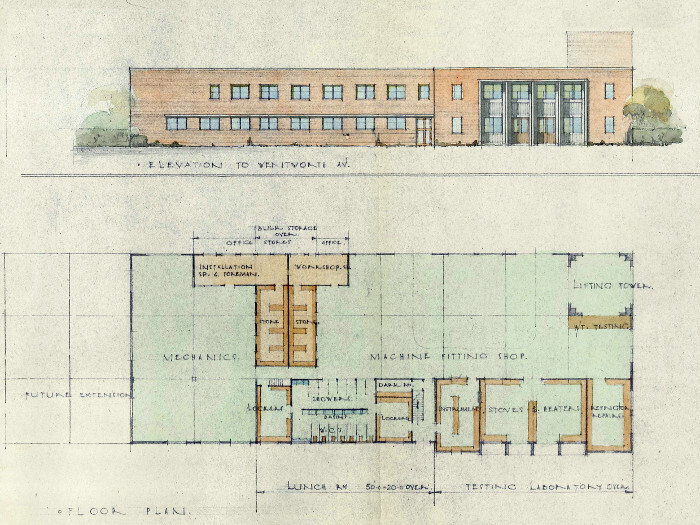 In December 1948, the NCPDC approved the revised workshop design Plan No. A.C.T. 18322. Plan No. A.C.T. 18322 of proposed electrical workshop at Kingston. Click on plan for larger view.